I believe that I was in middle school when I really got into music. From that point, I never looked back and music has been a very important part of my life, accompanying me through good times and bad. It didn't take me long to realize that no everyone shared my passion for music. Everyone likes music, but if you ask someone what kind of music they are in to and their reply is "All kinds. ", that person doesn't have a true passion for it. Movies often have difficulty portraying a true love for music, especially for those whose very souls are moved by song. Tumbledown attempts to right this wrong by showing the effect which music can have on people. Hannah Miles (Rebecca Hall) has spent the past year living alone in a cabin in rural Maine, mourning the death of her husband Hunter. Not only had Hunter been the love of her life, he'd also been an accomplished musician, having released one album which developed quite a following. Some days, Hannah sits in the cemetery, simply watching fans place things on Hunter's grave. Writer Andrew (Jason Sudeikis) is putting together a book on musicians who died young, who, after having no luck reaching Rebecca by phone, arrives in her small town. At first, she is certain that he's just a muck-raker looking for gossip. But, after Hannah meets with Andrew, she becomes somewhat convinced that he's legitimate and she asks him to join her on a project which may help to ease her grief. 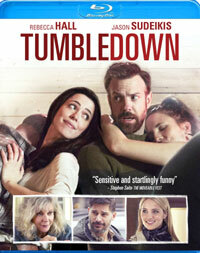 Perhaps Tumbledown should have been called "Jumbledown", as this movie is very confused. It's nearly impossible for the audience to get a handle on just how well-known Hunter Miles was. We see fans making these Jim Morrison/Jimi Hendrix-esque pilgrimages to his grave and Andrew wants to profile Hunter in a book, but when Hunter meets Hannah's mother (Blythe Danner), she implies that Hunter's one album is obscure. The real head-scratcher is that again, people flock to this guy's grave and Andrew is a devoted fan, and yet, Andrew does not know how Hunter died. In today's world, even if he was just a minor celebrity, I think that through the internet we would know how he died. There's also the question of Hannah's financial situation. We see her living in this cabin by the lake, seemingly not working, and we assume that she's getting by on money generated by Hunter's album. But, she later states that Hunter's life insurance didn't leave her with much. I hate it when movies ignore the fact that it does take money to survive in the world today. If you are like me, and enjoy details and continuity in your films, then Tumbledown is going to let you down. The movie then decides to move on and mix its unsure approach with cliches. From the outset, Hannah is a very annoying character. Tumbledown decides to play the card that since Hannah is grieving, she's allowed to be histrionic and all over the place. She's very friendly with the local book store owner (Griffin Dunne), and VERY friendly with Curtis (Joe Manganiello), but she's allowed to be completely rude (and commit petty larceny) towards Andrew because she sees him as an interloper who wants to stomp on her husband's legacy. Once she does allow him into her home, she still runs very hot and cold. Is her behavior justified? Well, no. And as a movie character, it makes it very difficult for the audience to relate to or feel sorry for her. We also learn a secret about Hannah's past which never goes anywhere. And if you are looking for a deep, intricate story, Tumbledown lets us down here as well. This may be the most disappointing aspect of the movie, as the story hints that we may be dealing with something other than a simple grieving widow. But, no, it decides to do away with any sort of next-level thinking and sticks to a very basic story which never tries anything different. And I'm not going to give too much away here, but that one truly Hollywood sell-out thing that you hope won't happen at the end...happens. I really like the idea of a movie exploring how a musician can affect those around them, both the family and fans. There have been plenty of rockers who I would have liked to have met or told in person how their music had a place in my life. And there's no doubt that the death of a spouse can have a profound role in someone's life as they attempt move on. Tumbledown bungles both of these ideas, delivering a movie which doesn't satisfy with the drama or its approach towards music (and the music in the film is terrible). The only redeeming feature here are the smartass comments from Sudeikis. Otherwise, this is a huge waste of a recognizable cast. Tumbledown gives indie music a bad name on Blu-ray Disc courtesy of Anchor Bay Entertainment. The film has been letterboxed at 2.35:1 and the Disc contains an AVC 1080p HD transfer which runs at an average of 23 Mbps. The image is very sharp and clear, showing no overt grain and no defects from the source materials. The colors look fine and the image is never overly dark or bright. The level of detail is good and the depth is pleasing, most notably in the exterior shots. The Disc carries a Dolby TrueHD 5.1 audio track which runs at 48 kHz and an average of 1.0 Mbps. The track provides clear dialogue and sound effects. The in-film music (though annoying) sounds fine. The stereo and surround effects are very subtle, but they are clearly evident during the street and forest scenes. The Tumbledown Blu-ray Disc contains two extras features. "The Making of Tumbledown" (23 minutes) offers comments from the cast and the creative team, as well as some on-set footage. The piece begins by exploring the origin of the script, moves into some examination of the themes and characters, and then looks at the production. "The Music Behind Tumbledown" (3 minutes) profiles Damien Jurado, who provides the vocals for Miles in the film.